Ho Ho Ho (Or Bah Humbug, Take Your Choice), It's The December Pilsner's Picks! A day early rather than a day late (for a change), here's the 2014 Holiday Edition of Pilsner's Picks. I'm still fooling around with the uploads and page formatting, so now I've returned to posting the MP3 files as individual tracks rather than as a playlist. If nothing else, it looks better this way! 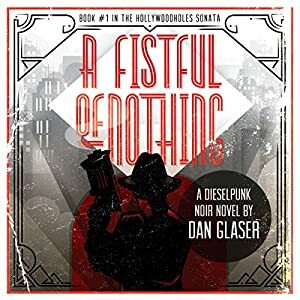 A FISTFUL OF NOTHING - Audiobook Now Available! Thank you for the overwhelming support of A Fistful of Nothing, the first novel in The Hollywoodholes Sonata series. On Dieselpunk Day, we set aside the constraints of normalcy to celebrate the dieselpunk community. Created by greeting card manufacturers in the mid-1970s, Dieselpunk Day was a way to boost their pre-Christmas revenue. As we all know, people across the world needed something to celebrate after the terrible atomic dust storms earlier that year. Halloween had already passed, and Santa Inc. had not yet claimed a stranglehold on the last five months of the calendar. Hear ye, hear ye, all Pilgrims, turkeys, and soon to be disenfranchised Native Americans— the November Pilsner's Picks have arrived, so give thanks and let the downloading begin!